You could use any medley of seafood and fish for this dish. Although, I find that croacker is better when fried( *tongue out hehehehe 🙂 ) You could also use it for this soup. Place the cat fish and other seafood in a bowl. Blend the onions and peppers. 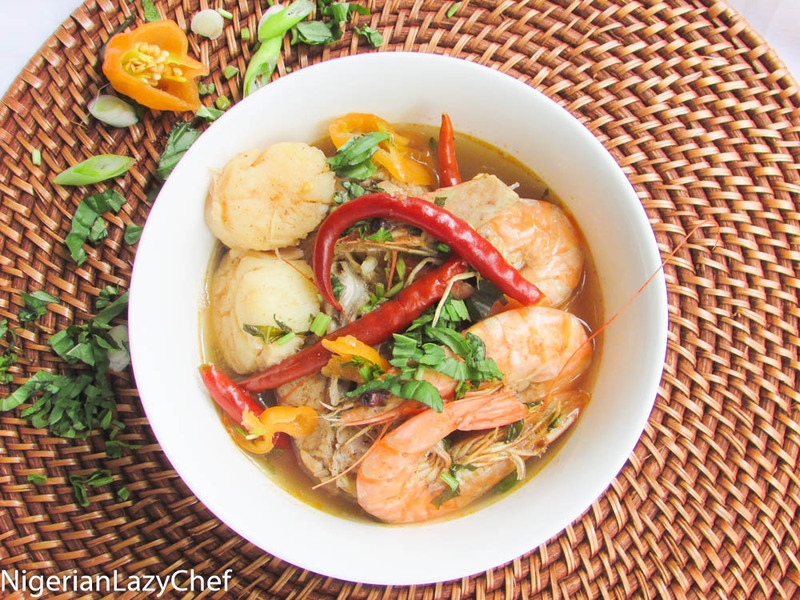 Mix with the pepper soup spice, pour over the seafood and let it marinate for about 1-12 hours. This entry was posted in Fish peppersoup, Fish recipes, Fish Recipes, fresh fish peppersoup, gluten free nigerian recipes, Gluten free recipes, Healthy Nigerian, Healthy Nigerian Dishes, Healthy Nigerian recipes, Nigerian soups, Pepper soup, Peppersoup, sea food, sea food recipes, Seafood, Soups, Uncategorized and tagged How to make peppersoup, Nigerian food blog, Nigerian peppersoup recipe, Nigerian seafood peppersoup, Nigerian seafood peppersoup recipe, Peppersoup recipe. When do you put in the crab? What do you mean by “check your spices “? I have never even eaten cab fish before , and where I m gonna find the recipe products in Pakistan ? by the way where you from ?? are you from Nigeria ? Cuz my bro lives there in Kenya he move everywhere around in Africa , like Uganda Kenya and Tazania , and no I m asking for Cab fish , where I m gonna find it in Pakistan ?